As dyeing experts, we thought it would be a good idea to share our knowledge with you, so that you could gain a greater understanding of the dyeing process and techniques used in hank dyeing yarns for the carpet industry. 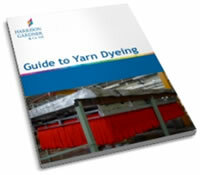 This easy to read guide will give you an insight into the world of yarn dyeing and why knowledge and experience are important factor in providing shade, fastness and overall dye quality. All you need to do is complete the simple form below with your details and you will given instant access to download a PDF version of our Guide to Yarn Dyeing.